In today’s mail, the first seed catalog of the season! They start arriving around this time every year, it’s always been EXCITING, and now is no different. What I said last year just about covers it once again. I strive to live in the moment and enjoy every day, but….SPRING IS COMING! Awesome! I can’t wait to get my catalogs! 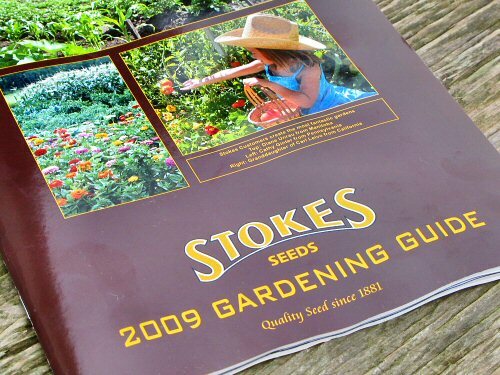 LOL…it is funny that we gardeners/farmers are so universally turned on by garden catalogs! I hoard them, ponder, dream, and mark them up with notes. Way better than any magazine I could ever read. My fave is the catalog from Territorial, I just love it and White Flower Farm is amazing to look at and dream about! I can’t wait till the mailbox is just full of them!!! My first one came yesterday! With catalogs in hand, I can almost pretend that Spring starts tomorrow, not in 5 or 6 more months. We don’t send out catalogs, not only does it require a lot of paper, which is not very environmentally friendly, but it is also very expensive for smaller family owned businesses such as ours. We hope you will still explore our website and enjoy all of the new varieties we have for 2009! Botanical Interests: You have a cool-looking online catalog! I particularly like the call to submit “product” photos. It’d be great to see veggie photos taken from real gardens in a catalog. Meanwhile, I don’t feel guilty about liking my printed seed catalogs, and I don’t think turning to the Web is automatically a more environmentally-friendly alternative. I think the Internet is great while it’s around, I use it and recommend it, and it’s a great equalizer for small businesses. But, promoting a world where we increasingly sit in front of screens, tapping on buttons, on expensive, soon-to-need-replacing computers, over expensive, tenuous Net connections doesn’t seem too healthy or environmentally sustainable to me. The more we put stuff between ourselves and the physical world, like by clicking a mouse rather than turning a page, the less accountable and engaged we become with our planet. I think that’s observable truth. Ultimately, increasingly removing ourselves to an electronic, digital world could turn out to be the most environmentally unfriendly thing we’ve done so far.